I’ll share a little secret with you…….I was homeschooled! Yes, I’m sure I’ve mentioned it sometime before, but here I am, a homeschool grad! If you ask my friends I think they’ll tell you that I turned out ok. Homeschooling certainly didn’t ruin me so don’t you worry about messing up your own children. They will be ok! Actually, I had such a great experience with homeschooling that I was determined to homeschool my own kids. It took several years of trying to convince my hubby who thought homeschoolers might be slightly strange and that somehow I was an odd exception. But he came around to the idea, and by the time our oldest was nearly school age he was my biggest ally and a huge homeschool advocate. 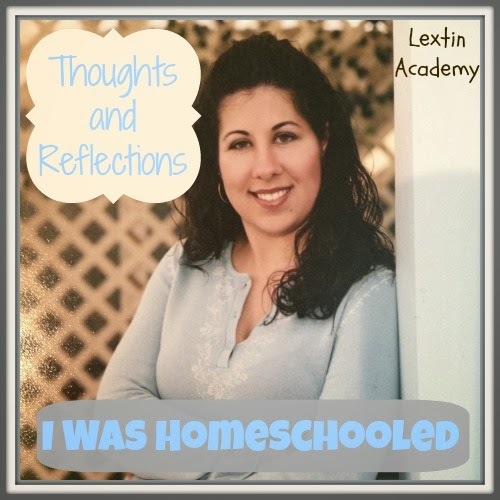 So, here I am homeschooling away and reminiscing about my homeschool experience. Care to join me on my walk down homeschool memory lane? For me school began at a nice little preschool – just like every other child in my little neighborhood. Then it was off to the local public school. I attended that school from K through 2nd grade. My memory might be a little fuzzy but I do remember one crazy, crazy first grade teacher who called me names and made me cry. My parents had to intervene and get me moved into a different classroom. I had become a struggling student in math and my desire to learn was absolutely crushed. And that’s when I began asking a nagging question of my parents, “Will you homeschool me?” My introverted, book-loving, high achieving self did not want to be crushed under the mountain of homework, legalism, and female hormones any more. I wanted freedom and I wanted out. I wanted to be a self directed learning because I dearly loved to learn but I wasn’t able to spend time doing what I enjoyed most. I wanted to have a job and begin working. I wanted to spend more time on my piano studies. I didn’t want to spend all day in a classroom only to arrive home just before dinner and have hours and hours of homework to complete. I know my parents thought my idea was crazy and that I was probably crazy too. What middle school girl with great grades, numerous friends, and a good school experience suddenly asks to walk away and experience a drastic change? Well……me! That’s who! I knew of several homeschoolers through church and through friends of friends. I didn’t know exactly what homeschooling entailed. I only knew that I needed a change of environment and a change of pace. I had pushed myself hard during my time at the private school and was a top student and I had the debilitating migraines to show for it. My naturally introverted personality made me tired of the daily drama yet I still ran for class office and held more than one position in student government. I volunteered as a teacher aid and also helped tutor other students. I was involved and suddenly decided I no longer wanted those things as a focus. I was ready to look ahead and look to my future. I wanted more focused studies and classes to prepare me for college and I even wanted to start taking college courses. Initially my parents looked at different private school options and we went to open houses, took tours, and met with teachers. No, it still wasn’t what I wanted. I didn’t want a subtle change in environment. I wanted 180 degree change – a radical move to staying at home with my mom as my sole teacher. I know she didn’t feel quite prepared to teach me in all subjects and I was a little nervous as I thought about tackling math and science topics without my teacher at the blackboard, but I still knew that homeschooling was somehow right for me. The summer after my 9th grade year of school, my parents agreed that I didn’t have to return and that they would homeschool me. I was thrilled and could not wait to begin. My mom had researched and chosen curriculum and that fall we began our short 3 year adventure. Those years were my favorite in all my years of schooling. I was always challenged and I never missed the boredom of sitting in a class all day. I had time to nourish my passions and spend time on my piano studies – even starting a community service organization with my friends to take music into the local nursing homes. I took classes with co-ops, tutors, the local community college, and online. I had time to read and explore on my own. I worked at my own pace. I had the opportunity to have a part time job in a doctor’s office. And I had even more time for friends. Nope, I never missed the schooling experience. I loved every aspect of being homeschooled. I would not trade those 3 years for anything. I enjoyed the relationship I was able to build with my parents. I spent more time on preparation for college. I had more time for deep Bible study and indepth music studies. I learned how to direct my own studies and how to manage my time well. I was prepared for college and beyond. While some might not consider me a “true” homeschooler because my experience was so short; I am proud to claim to be a homeschool graduate. Those years did the most to shape who I am today. So, I was homeschooled and it was all my idea! I'm glad you had such a positive homeschool experience!!! Thanks for sharing it. Thanks for sharing. When my kindergarten aged daughter expressed the desire to go to the school like the kids on tv go to, my 11 year old daughter was quick to tell her just how NOT like tv, public school was for her. She was quick to emphasize how much more fun and flexible homeschooling is. You're welcome! I'm always happy to share my homeschool experience so others can know that a homeschool grad would choose to do it all over again. It was a great experience and I loved the flexibility I had!